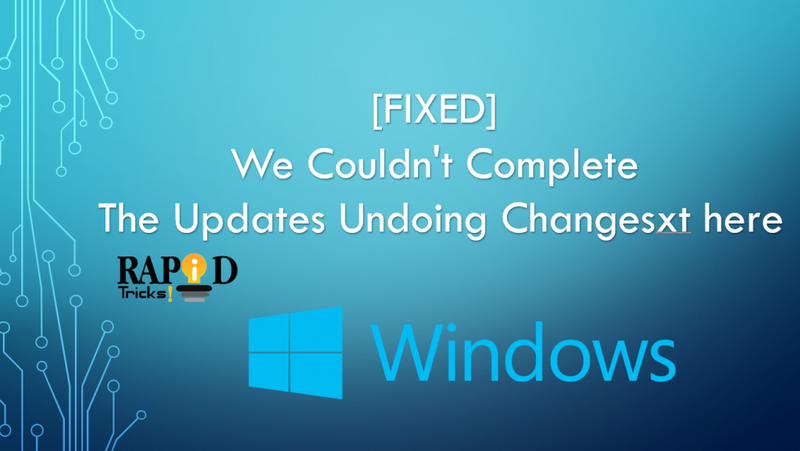 Were you trying to update your Windows computer and ended up seeing the “we couldn’t complete the updates undoing changes” message? If you’re facing this problem, then you are not alone. This is one of the most common errors that many Windows users face. In this case, your Windows computer stucks in a loop for uncountable minutes and fixing it can be very hard for you. However, possibly there is a small fix that you can try to get rid of the “we couldn’t complete the updates undoing changes” error. So let’s just dive right into the topic without wasting any further time. Step 1: First of all, you have to press Windows Key + X and then run the Command Prompt with Administrator rights. Step 4: Now you have to delete all the files that you get to see in that folder. Step 5: Now again press the Windows Key + X button and launch Command Prompt with admin rights. Step 8: In the end try installing the updates again and see if you are getting the “We couldn’t complete the updates undoing changes” error or not. Step 1: At first, press the Windows Key and type in Settings and open it. Step 2: Now you have to choose the Update and Security option. Step 3: From here look for the installed updates history. Step 4: Now look for the update that is causing the issue and uninstall it and you are good to go. Step 1: First of all you have to download Windows Update Troubleshooter. To download the software you can click here. There are two Windows Update Troubleshooter applications are available. One is for the Windows 10, and the other one is for Windows 7 and Windows 10. Download the Windows 10 version. Step 2: Once downloaded, double-click on the file and run it. After that follow all the on-screen instructions to install the application to your computer. Step 3: After that launch the application and it should start detecting problems. Step 4: Also in between, it might ask you for administrative rights. Simply provide it, and you are good to go. Step 5: In case if it finds any problem simply click on the option that says click on Apply to fix this and you are done. Step 6: Now again try to install the updates and see if you are still getting the We couldn’t complete the updates undoing changes or not. Step 1: First of all press the Windows Key + R button to open Run window. Step 2: Now here you have to type “services.msc” and hit the Enter button of your keyboard. Step 3: After that, you have to look for the App Readiness option and right click on it and then select Properties. Step 4: From here you have to set the Startup type to Automatic and click on the Start option. Step 5: In the end save everything and close all the windows. Once done, go ahead and restart your computer and check if the issue still persists. If yes, move on to the next method in the list. There can be a high chance that your Windows C:/ drive does not have sufficient storage to download and store the update file. Hence, as a result, the computer is not being able to complete the setup. Step 1: First of all, press the Win Key + X button and select the Disk Management option. Step 2: After that right click on one of the partitions apart from C drive and select Shrink Volume option. (In case if any of the drives does not have much space, then try to free up space by deleting files or moving them). Step 3: Once the shrinking process is completed, right click on the C drive and select the option that says Extend Volume. That is it. This will increase the storage of your C drive, and you will easily be able to download updates. Once done, just go ahead and re-run the update process and see if it has fixed the problem or not. Step 1: First, launch CCleaner software so it can fix the registry issues. Step 2: After that create a new admin account. Step 3: Disable Antivirus and VPN applications if you have any. Since these programs often cause issues. Step 4: In the end, try installing the updates again and see if you are getting the We couldn’t complete the updates undoing changes message or not. So those were all the methods to fix the “We couldn’t complete the updates undoing changes” message error. Now go ahead and try the steps out and see if it is working for you or not.